We take manual brewing seriously - that's how our engineers came together for the core, unique feature of our RJ3 Pour Over Carafe: the multi-purpose glass measurement cup. Measure, store, or stand. Designed for ultimate practicality, our glass measurement cup transforms your pour-over coffee routine into a seamless, enjoyable experience: no more clunky measurement cups, spillage worries, or confusion about where to put that dripper. Just measure and pour. Our team here at Ovalware are on a quest to bring out the best from your coffee beans. We value the simplicity of coffee making and the beauty and pleasure of manually brewing your own cup of coffee. The word "oval" stands for the potential of perfection we see in every bean. Our wares are engineered to realize and deliver this perfection to you. From the convenience of home. You don't have to be a professional Barista - we'll be there for you along every step. 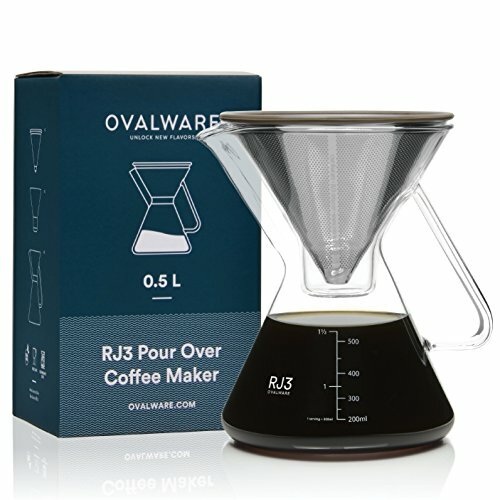 ➤ POUR YOURSELF A CUP OF HOME-BREWED POUR OVER COFFEE 100% RISK-FREE! Your satisfaction is our top priority, that's why we back our premium pour over coffee machine set with our unconditional guarantee! If you're not 100% thrilled with its stylish design and professional construction, we promise to offer you a prompt and full refund! No questions asked! Pour risk free, my coffee aficionado! ➤ THE MULTI-PURPOSE PRECISSION MEASURING CUP WILL MAKE BREWING A BREEZE, since it's designed to solve 3 problems at once! You can use it as a coffee measuring cup for your coffee beans, a coffee filter stand for your stainless steel coffee dripper and it can double as a coffee carafe lid to keep your coffee the perfect temperature, longer! ➤ COFFEE IS AN ART BUT BREWING IT IS A SCIENCE, that's exactly why we have used only the highest-quality borosilicate glass for our 0.5L coffee carafe and the measurements on both the cup and the carafe will help you brew your coffee with absolute precision. Plus, the RJ3 pour over brewer is not only BPA-free, but is also dishwasher safe, so you won't waste time cleaning it!